Home Enlivening Nope, Not Listening !! ‘What do you want’, I asked quietly? There was someone else in the room with me, an overeager energy that had me feeling like I was negotiating a deal like two lawyers would fighting over a clients fate. ‘Stop trying to believe I don’t exist’, the other voice said in a tone as if to manipulate the situation! ‘You exist alright, but it doesn’t mean I have to believe everything you say’, I replied a little more frustrated than normal. Somedays are better than others, wouldn’t you agree, how we deal with our wandering mind varies from day to day? The Ego knows when we are vulnerable much sooner than we actually feel susceptible. 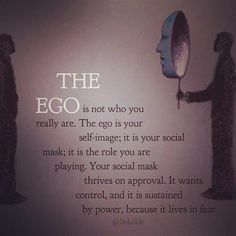 The Ego is sharp, military trained by the best, taught through regime instruction years of drilling from one source or another, it never falters in its skillful duty to coerce and intimidate, and yet when we are aware of the voice in our head it becomes easy to recognize the oppression. ‘I don’t need anything from you’, I said with a more stern energy, I was beginning to feel more in control and I didn’t want this conversation to go any further than it already had, time to shut it down and move on I thought to myself. It’s not a matter of arguing with the Ego it only fuels it with more false power, it’s more about just letting the energy of its voice fade into the background like a curtain call at the Theatre, the red velvet drapery closes ever so slowly until the stage behind disappears out of sight signalling the time has come to leave. Once you master the art of recognizing the Ego when it wants to control the less control it actually has, leaving you with your intuition, your gut feeling to deal with the situation. It only takes practice being able to catch your negative voice before the pessimism grows, and the courage to say ‘no’ when you know you really need to, for your own good. Our Ego will pull out all the stops, skillful words in our head to keep us from moving on and advancing our self for the betterment of our Soul, but nearly all of what you hear yourself think is true, actually, most of what you say to yourself is a conditioned pattern of behaviour fuelled with lies. Start to question the words that swirl around in your head because if you do you then have a choice to either believe what you say to yourself or NOT.